If you’re a fan of iZombie of course you’re going to want this set for your collection. And if you haven’t seen the show, would it kill you to give it a chance? I know someone who is a top chef with brains just in case! If you've never seen the CW's iZOMBiE you are missing out on one fun show. For those of you that have seen it, bear with me and let me fill in the non-watchers. "iZombie is loosely based off a comic book series from Vertigo. In this CW version, adapted by Rob Thomas (not Matchbox Twenty Rob Thomas)... the man behind Veronica Mars. The Story revolves around Liv, AKA Olivia Moore (Rose McIver who has one a stint on Once Upon a Time as Tinker Bell and as Summer, the Yellow Bear RPM Ranger in Power Rangers R.P.M.) who was planning to be a happily married doctor when a friend tells her to go out and live…go to a party and at that party is an outbreak and Liv is infected. Pale as a sheet, white as snow hair, and now craving brains, Liv decides to break off her engagement, and move into a position at the City Morgue where she can get paid with free lunches (all the brains you can eat!) Only thing is, with each brain comes the memories and characteristics of that deceased person. Which brings Liv to Detective Babineaux (Malcolm Goodwin; American Gangster, Run All Night), pretending to be a psychic to help solve murders. Onward and Upward…. skip 31 episodes and at the end of Season Two, you find Liv and the rest of her Scooby Gang infiltrating a Max Rager party/concert with Rob Thomas, (yes the Matchbox Twenty one) to release Drake (Liv's boyfriend) along with several…basically, test subjects that Vaughn is holding. Stuck between a rock and a hard place, Liv is forced to kill Drake, and while surrounded by zombies and trapped, has to explain to Detective Babineaux that Zombies exist….and she's one of them. Then, saving the day, a SWAT team comes in cleaning up the situation. In walks Vivian Stoll, the new "Person In Charge" who, while having a snack on Rob Thomas's brains, tells Liv she's planning for a bigger picture, asking... are you with us or against us? So walking into Season Three, we have a whole new situation. The idea of keeping Zombies a secret was a rather idealistic concept, but not a realistic one, and Vivian Stoll (Andrea Savage; Veep) is convinced when it goes public they will all be hunted down so what's Vivian's idea? Zombie island! A self-sustaining island where zombies could live peacefully….with of course some imported brain food. At the same time, there's a group of conspiracy theorists who believe zombies are out there and well…let's just say there's trouble ahead. What's cool about this season is generally there's a crime to be solved in each episode and its pretty much done, but in this season, one of the murders turns out to be part of a much bigger storyline that covers over several episodes. It was a nice change! I mean I totally love seeing Liv on all kinds of brains and this season has a fun variety for her to deal with and no one can deny that their favorite part of iZombie is the brain cooking & plating sequences! iZombie is out now on DVD and iZombie: The Complete Third Season special features include the 2016 iZombie Comic-Con panel along with deleted scenes. If you're a fan of iZombie, of course, you're going to want this set for your collection. And if you haven't seen the show, would it kill you to give it a chance? I know someone who is a top chef with brains just in case! I give iZombie: The Complete Third Season 4 and a half brains out of 5, I love how they added several story arch to change the format and I can't wait to see where season 4 is going in 2018! 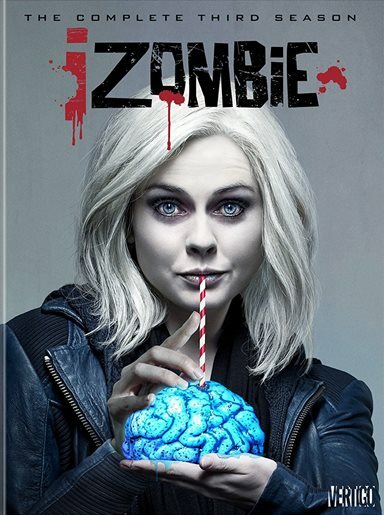 Download iZombie: The Complete Third Season from the iTunes Store in Digial HD. For more information about iZombie visit the FlickDirect Movie Database.